Is it luck or is it . . . Destiny? Are superstitions real? Rory Chasen doesn’t think so–until her beloved fiance walks under a ladder and is killed by a car five minutes later. Needing closure, Rory takes her dog Pluckie to a town called Destiny, where superstitions are a way of life. 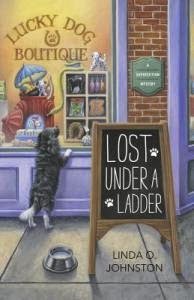 Rory’s visit to Destiny takes an unexpected turn when Pluckie saves the life of Martha, the owner of the Lucky Dog Boutique. To show her gratitude, Martha offers Rory a job at the pet store. But when Martha becomes the prime suspect in the murder of the local bookshop owner, Rory refuses to believe that she would do it. Rory is convinced the real killer still roams Destiny’s streets, and she must uncover the truth before Martha is hauled off to jail. In this book Rory Chasen goes to Destiny where all superstitions come to life. When Rory's fiancé Warren walks under a ladder and ends up dead Rory is stuck wondering if the superstition was really true or just a bad series of things that happened to lead Warren to his untimely death? In Destiny Rory notices how much people buy into the superstitions like walking on cracks, finding a lucky penny etc. 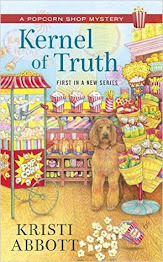 Rory walks her dog Pluckie and next door to a bookstore finds the Lucky Dog Boutique where the owner seems to be missing but is injured and Pluckie saves Martha Jolpie the owner has had an accident and suddenly Rory and Pluckie's time in Destiny has gotten a whole lot busier. 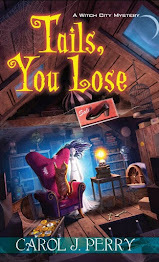 Then when superstitious author and co-owner of the bookstore wind up dead it's up to Rory to do what she can to clear Martha's name as she recently had a heated fight with the victim Tarzal. With only that for the police to go on Rory will uncover what she can to clear her new friend Martha. This book was cute and quirky and had you really wondering who killed the author and how Rory was going to figure it out? I also enjoyed meeting the people of Destiny including the cute chief of police Justin who seems to have a thing for Rory despite Rory not being ready for any kind of romance. I loved this story and can't wait to see what is next for Justin, Rory, Martha and of course PLUCKIE!